The Center for Ethics and Culture will award the 2018 Notre Dame Evangelium Vitae Medal to former U.S. ambassador and Harvard professor of law Mary Ann Glendon at a Mass and banquet. 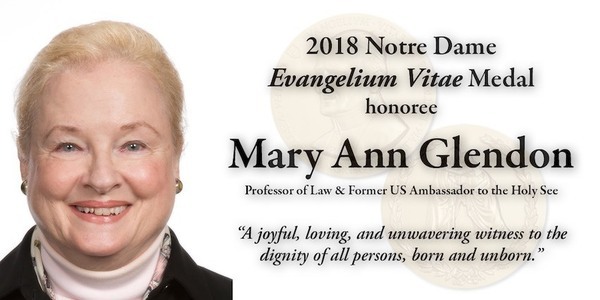 The Notre Dame Evangelium Vitae Medal, named for St. John Paul II’s 1995 encyclical on life issues, is the nation’s most important lifetime achievement award for heroes of the pro-life movement, honoring individuals whose efforts have served to proclaim the Gospel of human life by steadfastly affirming and defending its sanctity from its earliest stages. The Mass, celebrated by Bishop Kevin Rhoades of the Diocese of Fort Wayne-South Bend, will begin at 5:00 p.m. at the Basilica of the Sacred Heart. The Banquet will follow in the South Dining Hall. Both events are free and open to the public, but RSVP is required to attend the dinner. RSVP for the Mass and dinner via this link.